The Romantic Comedy, starring Jeannie Berlin, Steve Carell, Jesse Eisenberg, Blake Lively, Parker Posey, Kristen Stewart, Corey Stoll and Ken Stott, will be released theatrically this summer. NEW YORK, NY (February 18, 2016) – Woody Allen’s latest as yet untitled feature film has been acquired for all North American rights, including theatrical and streaming, by Amazon Studios. 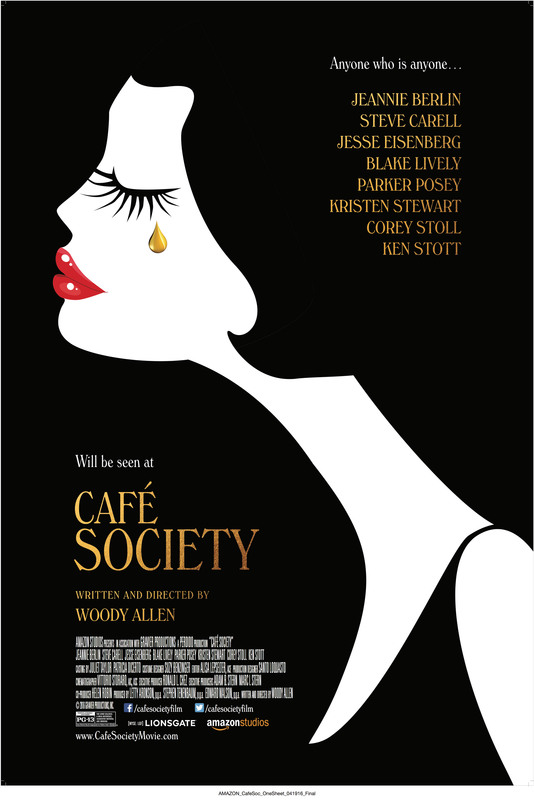 The film, shot last summer on location in New York and Los Angeles, is a romantic comedy staged in the 1930s and stars Jeannie Berlin, Steve Carell, Jesse Eisenberg, Blake Lively, Parker Posey, Kristen Stewart, Corey Stoll, and Ken Stott. “Like all beginning relationships, there is much hope, mutual affection, and genuine goodwill -- the lawsuits come later,” said Allen. Producers of the new film include Allen’s longtime collaborator, Letty Aronson, as well as Steve Tenenbaum and Edward Walson. Executive producers are Ronald L. Chez, Adam B. Stern, and Marc I. Stern. The deal was negotiated by John Burnham and Jessica Lacy of ICM Partners, Erika Aronson of Taborlake, and Loeb & Loeb on behalf of the filmmakers. Amazon Studios is known for bringing Prime members the multi-Golden Globe-winning and Emmy-winning series Transparent and the multi-Golden Globe winning series Mozart in the Jungle, along with original hits like The Man in the High Castle, Red Oaks,Hand of God, Bosch and Catastrophe. Prime members also have access to a collection of Amazon Original Series for kids such as Annedroids, Gortimer Gibbon’s Life onNormal Street, Wishenpoof,and the Annecy, multi- Annie and multi-Emmy Award-winning Tumble Leaf. Coming soon will be the second seasons of Bosch and the romantic comedy Catastrophe, along with the debut season of the docu-series, The New Yorker Presents. First announced in January 2015, Amazon Original Movies is an initiative by Amazon Studios to produce and acquire original movies for theatrical release and early window distribution exclusively for Prime members. Like Amazon Original Series, Amazon Original Movies focuses on unique stories, voices, and characters from top and up-and- coming creators. In 2015 Amazon Studios released its first film, Chi-Raq from critically acclaimed filmmaker Spike Lee. Chi-Raq is a modern day adaptation of the ancient Greek play “Lysistrata” by Aristophanes starring Nick Cannon, Wesley Snipes, Jennifer Hudson, Teyonah Parris, D.B. Sweeney, Harry Lennix, Steve Harris, Angela Bassett with John Cusack and Samuel L. Jackson. Chi-Raq is now available for Prime members to stream exclusively. Next up, Amazon Studios will release director Benjamin Dickinson’s Creative Control in theaters on March 11, 2016.